This past week has been a wonderful week getting to know our new family as well as serving in ministry at many places. Nine years ago we met a young woman who was part of Jamie’s Health Care team. She was only 19; her name is Mahiba – the same age as Bobby. It wasn’t long before we our hearts melted together and we were family. It’s been 8 years since we’ve seen her, but we’ve kept in touch, thanks to the internet and the occasionally time when we’d phone her. Not only our lives have full in the past years, but she has been able to accomplish many things as well. Mahiba continued to work with YWAM for a bit and then went to nursing school where she obtained her BSc in Nursing to become an RN. This fall will be 3 years that she has been married to a wonderful pastor, Dickrose. We’ve had the privilege to be staying with her and her husband who live with his mother. staying for night as we talked late into the evening (yes, it was late as dinner in South India is around 10 pm!). 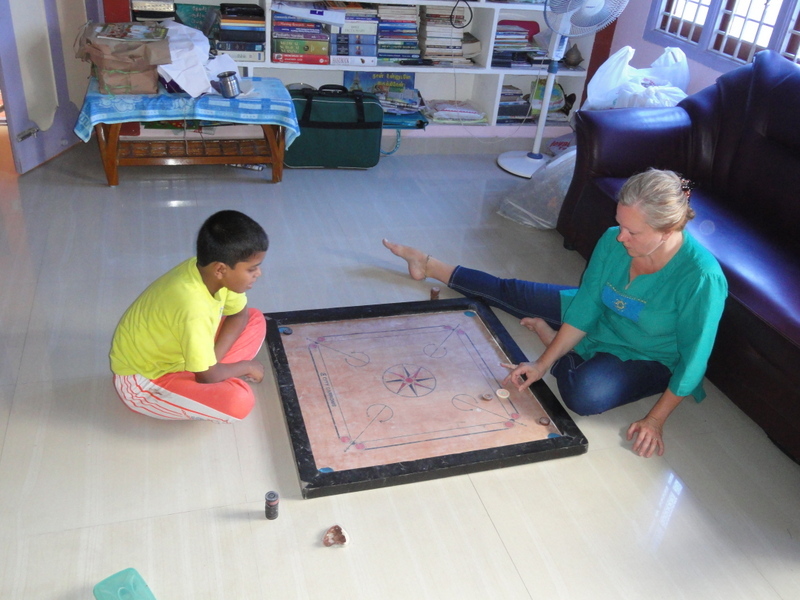 When we were not outside the home visiting a village, doing medical care or speaking to students, you might find us playing a game of Carom with our nephew (10), reading to our niece (4), watching a BBC wildlife program from our laptop with 6 kids around us, eating amazing food or just talking together and sharing the similarities and differences of our cultures. “Mum” who is the head of the house (55 years old) has been single for many years since her husband was bit by a snake and died. She rules the house and although she does not speak much English, our communication is not difficult, and we have been blessed by how she has served us all week with every type of Indian food she could cook. Brother-in-law has taken time off of work to drive us to some sights as well as show us his office where he works as a legal advocate and the court house where his line of work takes him. The past few days we have also seen many of Mahiba’s family as they have come to visit. Today we say ‘so-long’ until we come back for a couple of days to catch our plane at the end of August. Although we have been blessed that this family has shared their lives with us, we should not be surprised as Indian culture is all about hospitality. And they do an amazing job!